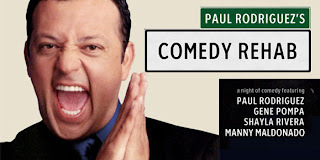 Fourth Row Center: Film Writings by Jason Bailey: On DVD: "Comedy Rehab"
Paul Rodriguez’s Comedy Rehab special begins intriguingly, without much fanfare: some posters in front of the theater, comics hanging out backstage, cutaways to the warm-up guy. Backstage, Rodriguez saunters out to his position behind the curtain, gets himself in place, and then works himself up—running up and down the fake stage stairs, planning his entrance, getting his energy going. Then he steps out on stage, and puts something like 30 years of comedy expertise to work. Comedy Rehab finds the ace stand-up returning to Santa Fe, New Mexico, where he got his start in comedy, to perform and to introduce a crew of up-and-coming Latino comics. If there’s one major complaint about the program, it’s that there’s not enough Rodriguez—or that he makes the mistake of opening the show, giving his protégés the textbook “hard act to follow.” He’s so funny, such a skilled master of the form, that he sets a bar early in the show that’s too high for his fellow comics to reach. Rodriguez, who appeared on numerous Comic Relief benefits and on the The Original Latin Kings of Comedy special, is a smoothly professional comedian—his jokes are sharp and pointed, his transitions are fast, and his timing is expert. In his set (which runs about twenty-five minutes), he gracefully leaps from topic to topic—history, fidelity, aging, Latino family life, dieting—with conversational ease, and with plenty of laughs. He describes his meeting with Governor Schwarzenegger (“through an interpreter,” he explains, “because he doesn’t speak English”), does an uproarious bit about Latina mothers, and tries to decipher the puzzle of Lou Dobbs’s xenophobia, since Dobbs has a Latina wife (“Lou, if it wasn’t for us, you’d be jerking off!”). The subject matter isn’t exactly revolutionary; he discusses Viagra, and touches on the many differences between white people and Latinos. But unlike some of his less-talented contemporaries (read: Lopez), he can push his material past mere they-do-this-but-we-do-this observation and into a realm that is funny on its own terms (see his terrific bit on lost hikers). His first guest, Gene Pompa, has a dry, pointed wit (he describes a Southerner announcing “I don’t talk Mexican,” to which he replies, “You also don’t speak English”). But he keeps the audience at a bit of a distance; funny and clever as he is, his slightly standoffish style keeps him from building much momentum. Shayla Rivera’s set is the low point of the show; she’s likable as all get out, but she spends the first chunk of the set pandering for easy applause and relies too heavily on weak, obvious material. The third new comic is the best of the bunch, and gets a memorably introduction from Rodriguez: “You’ll be hearing a lot about this guy… because he just bought a high-powered rifle.” Manny Maldonado’s got a good, quicksilver energy, and his risky, off-beat material is refreshing (even if not all of it lands). His fast-paced, giggly delivery and itchy physicality are well-used, particularly for his stranger bits—for example, he describes catching a nine-year old smoking and asking “What are you stressin’ about?” Her reply: “Times tables… (blows out smoke) Tetherball… (blows out smoke)… Hannah Montana…” But a little of Maldonado goes a long way; by the end of his set, when he’s trotting out impressions, you wish he’d have stopped while he was ahead. Rodriguez is so clearly the best thing in the show that one wishes it had more of him, or that his comedy was more evenly spread throughout. By front-loading the show with his performance, it peaks too early; he’d have been wiser to do a brief opening, sprinkle in some jokes in the introductions, and save his monologue as a strong closer. But it’s still worth at least a rental, primarily for the opportunity to watch its talented host do his thing. "Comedy Rehab" is now available on DVD. For full A/V and bonus feature details, read this review on DVD Talk.